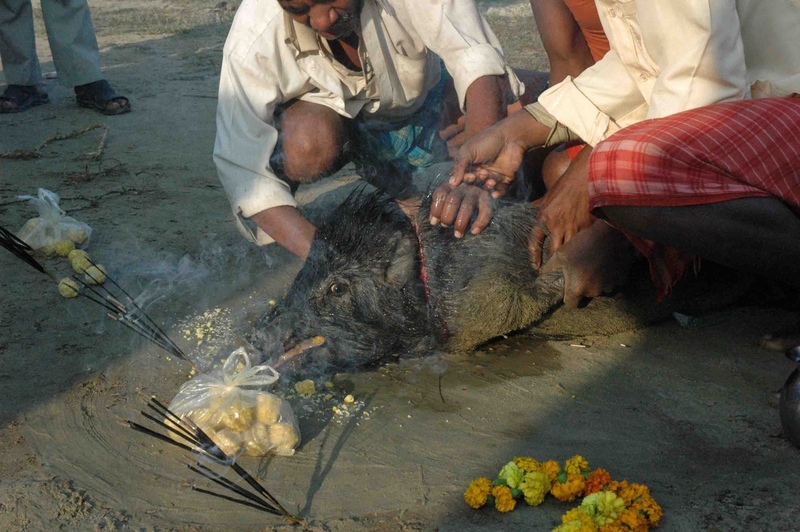 UK / Nepal: Brits lobby against visiting Nepal due to Gadhimai Animal Slaughter. Nepalese Minister Left ‘Speechless’ During Visit To London ! Tourism and Civil Aviation Minister Deepak Chandra Amatya, who went to Britain last week to promote Nepal’s tourism, was left speechless when he was asked questions about animal sacrifice at the Gadhimai Fair. Minister Amatya, who was there to participate in the World Travel Market 2014, was not just asked questions about animal sacrifice but was also handed over a petition signed by over 72,000 Brits. He has reported about that to the President’s Office, Prime Minister’s Office and the cabinet after feeling bad during his visit. Secretary at the Tourism Ministry Suresh Man Shrestha says Brits have been lobbying to advise British tourists to not visit Nepal due to Gadhimai. This may seriously affect the Nepali tourism industry. 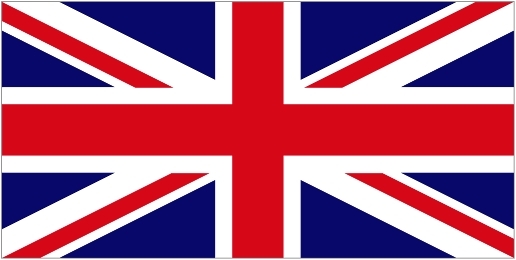 A total of 42,300 British tourists had visited Nepal in 2012, and 35,600 in 2013. Tourism entrepreneurs are expressing concerns stating that the campaign started by animal rights activists against animal sacrifice at Gadhimai across Europe can seriously affect arrival of European tourists. They fear that fall in arrival of European tourists, who are considered to be high-spending, can seriously affect the tourism industry. 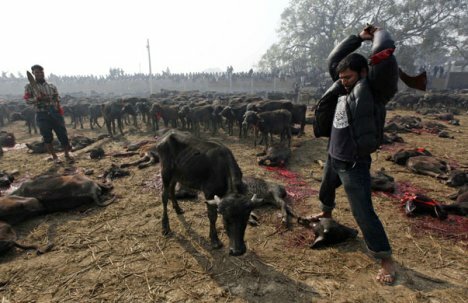 Foreign missions in Nepal, expressing serious interest about animal sacrifice during the Gadhimai Fair, have also urged the government to stop slaughter of animals at an open space. Joanna Lumley, who has fought for rights of the British Gurkhas, had also publicly appealed to stop that some time ago. “British campaigners have been urging Brits to not visit Nepal accusing Nepalis to be the most violent and cruel in the world citing Gadhimai. This is set to be the biggest setback for our tourism industry. We have informed all the stakeholder bodies and advised them about the issue,” secretary Shrestha adds. He reveals that over 72,000 Brits have signed petition against sacrifice of hundreds of thousands of animals at Gadhimai and such campaigns spreading rumors about Nepal have also been held in other countries emulating Britain. Constituent Assembly (CA) member from CPN-UML Rajya Laxmi Golchha on Tuesday had moved the Supreme Court to stop animal sacrifice. 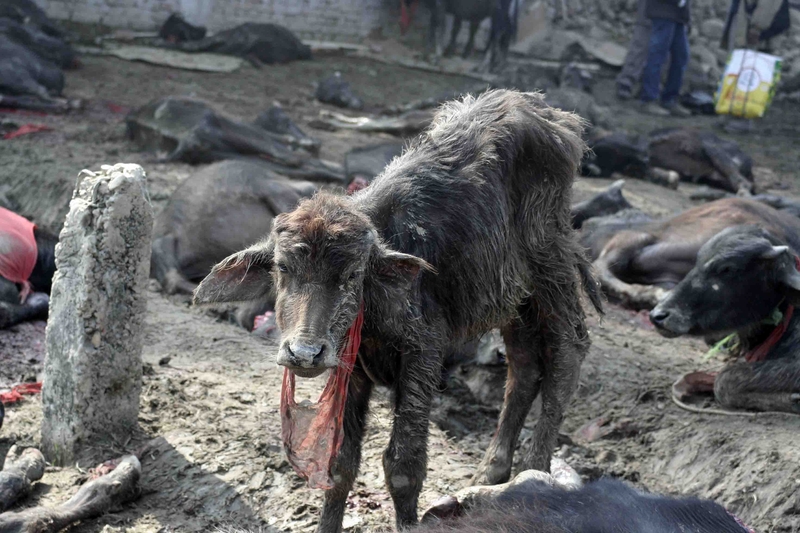 The Gadhimai Fair is organized every five year and around 500,000 animals are sacrificed during the fair. Secretary Shrestha reveals that the Ministry of Culture, Tourism and Civil Aviation has already directed Bara administration to stop any kind of filming/photography during the Gadhimai Fair. “The ministry cannot speak about whether to allow sacrifice or not. But photos and videos of that has seriously harmed Nepal’s tourism and culture,” he states. He says filming ban has been imposed this year as the foreigners have expressed concern due to the video filmed during the last edition five years ago. It is not about the filming! It is not about doing it in an enclosed rather than open space! It is not about reducing the numbers of those innocents who are “sacrificed” from 500,000 to a lesser number! It is about the unspeakable suffering of animals! It is about the senseless barbarism, the wanton cruelty, the horrific abuse of living, breathing, sentient beings! It is about the unacceptable and unconscionable “sacrifice” of animals to appease whatever god is worshipped…in an archaic, anachronistic practice that continues to be condoned and allowed by the governing officials of Nepal. It is about an uncivilized custom/tradition that belongs in the dustbin of history…along with human sacrifice, child slavery and the subjugation of women, among many other injustices that persist out of ignorance, indifference, corruption and greed! It is about a blight on the reputation of Nepal that will not go away so long as this aberrant horror persists. It is long past time for this hideous bloodbath to end! Citizens of conscience all around the globe say: NO MORE! THE KILLING MUST END ONCE AND FOR ALL! SAV Comment – Until Nepal completely bans this archaic bloodbath under the pathetic name of religion; we will continue to speak out against it. The Nepalese tourist industry has a simple choice. We wait, watch and see how they respond. 100,000 Animals Drowning Every Year in The Plastic We Throw Away. It was an otherwise healthy animal — but with a plastic strap looped round its neck — the kind you get around a parcel. Slowly but surely, as the animal grew, its noose would tighten. 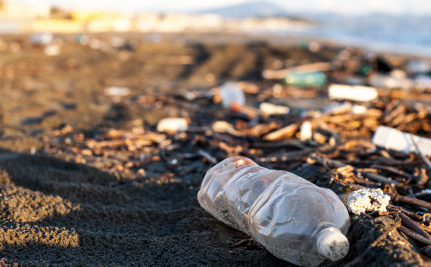 Hundreds of thousands of sea turtles, whales and other marine mammals are dying each year as a result of eating plastic, just like the sperm whale that was recently discovered dead in Spain with 100 plastic bags inside its stomach. As if these figures aren’t shocking enough, experts also believe that more than 1 million seabirds are also being killed from ocean pollution, ingestion or entanglement. England: Oh; She Thinks I’m Putting The Cat Out !! A classic from the late Marty Feldman. 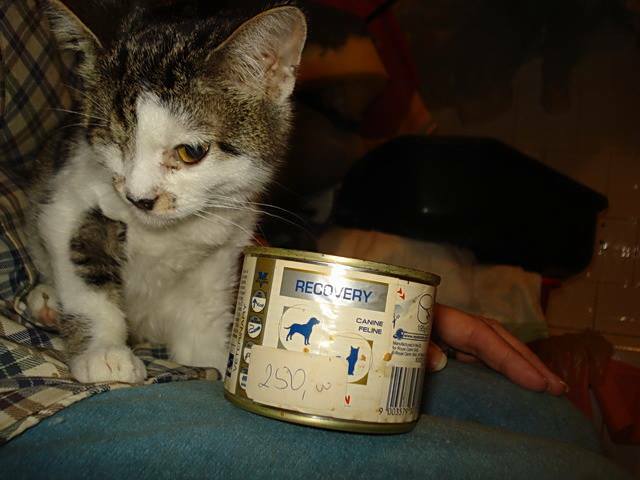 Serbia: 28/11/14 – Small Signs That Tok Is Showing Some Improvement. Nepal: 28/11/14 – First Info On The 2014 Frenzy Of Killings – Nepal Shames The World With Its Barbaric Animal Slaughter – List Of (Nepal) Embassy Contacts Given In Post Links. Photo from our friends at CIWF (London) – Nov 2014. “I’ve never ever seen anything quite like this and hope I’ll never ever witness it again. The scale of the suffering is vast – before me lie the bodies of thousands of buffalo, staining the earth, and the soles of the slaughtermen’s feet, red. What I’ve seen can only be described as a massacre. These animals have suffered great pain at the hands of an army of unskilled men and this is just the start….thousands of chickens, goats and other animals are next up in this 48 hour frenzy of killing. Thank you to everyone who signed our original petition calling for action on Gadhimai festival. We now need you to take action once more. Please, if you haven’t already, call on the Nepalese government to ensure this festival never happens again. We’ll update you next week with more information from our investigators as they return from Nepal. The team faces a long journey back so it may take a few days to get their eye-witness evidence out to you. 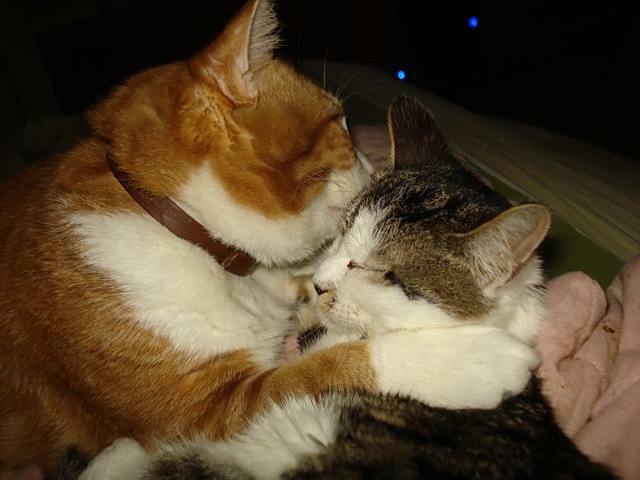 3 Important Petitions – Please Act Now – Thank You. Tell Secretary Jewell to Protect Wolverines! 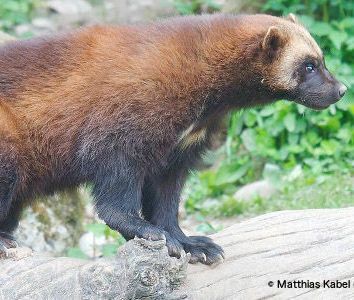 Despite a unanimous recommendation by scientists that the wolverine be listed as threatened under the ESA, the U.S. Fish and Wildlife Service (FWS) has scrapped plans to protect this imperiled mammal. Fewer than 300 of these animals are left in the Lower 48. What is worse, scientists estimate that on average, no more than 35 of these animals are capable of contributing each year to future generations of wolverines being born. Tell Secretary Jewell to do the right thing and give wolverines the protection they deserve! We have to act now to save one of the world’s most endangered whales from Big Oil. President Obama recently gave oil companies the green light to explore for oil off the Atlantic Coast, from Delaware to Florida. This means seismic testing — blasting sound guns 100,000 times louder than a jet engine underwater. Right whales raise their babies off the Atlantic Coast, and the calving season just started. But oil companies are gearing up to blast airguns in the area that can deafen, maim and kill these highly endangered animals. Seismic surveys use powerful explosions that disrupt whales’ feeding, breeding, communications and other essential behaviors. There are fewer than 500 North Atlantic right whales left in the world, and this plan could expose them to hundreds of incidents of harassment and harm. Update, 8:45pm GMT 25 November 2014: The Tanzanian President has tweeted that he will not pursue to deal with the hunting reserve — but we cannot back off until the Maasai are guaranteed permanent rights to their land, in writing. We’ve updated the petition text to reflect this additional, critical, ask. The Tanzanian government has been forced to back down once before — last year, after massive local and international opposition to the plan, Tanzania’s president promised the Maasai they could stay on their lands. Now the government has made a sudden u-turn, and told them the deal is back on andthey must leave their ancestral territory by the end of this year. Tell Tanzania’s president to keep his promise and cancel the corporate land-grab once and for all. The Maasai have been fighting the commercialisation of their traditional lands for decades, battling greedy investors eyeing the area’s extraordinary wildlife and trying to get hunting and tourism permits. The nomadic herders are furious at the news that this deal has come back to life. There is a lot of money riding on the Dubai deal. Local activists opposing the hunting reserve over the last two years have been threatened, and even killed. So international attention and pressure has a crucial part to play in exposing the Tanzanian government’s betrayal and forcing it to keep its promises. Please stand with the Maasai people who could lose everything, and help them keep their homelands. Sign the petition to Tanzania’s president telling him to abandon the deal now. Tanzania ditches plan to evict Masai for Serengeti ‘wildlife corridor’, The Guardian, October 7, 2013. 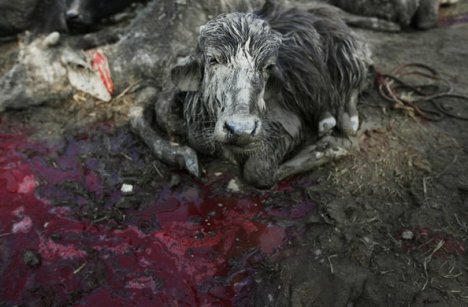 Nepal: Religious Mass Slaughter Due To Start Within Hours. Take Action Below To Send A Clear Message To The Nepalese Government – Never Again !! English group CIWF has investigators there now. Compassion investigators have just reached the site of the Gadhimai slaughter festival in Nepal. In a few short hours, the mass sacrifice will begin. Join us and tell the Nepalese Government: Never again. This weekend, the world will be watching as the Nepalese Government stands by and allows hundreds of thousands of animals to be brutally slaughtered. The Indian Government has committed to stop animals crossing the border into Nepal, and we have pushed hard for enforcement of relevant legislation designed to protect animals and people within Nepal. As a result, we are hopeful that fewer animals will be involved in the festival this time around, but we sadly expect that it will still continue. With just a few short hours to go, we now know that the Nepalese Government will not stop this year’s festival. But please, call on them to ensure this is the last time it ever happens. Never again must this be allowed to happen. India is doing wwhat it can, but the global campaigners must also play their part.